The front thigh muscles represent one of the strongest muscle groups of the human body. Its main muscle is the musculus quadriceps femoris consisting of four muscle heads. The quadriceps femoris is the only knee extensor of the human body what attaches high importance to it, especially when we erect the body (e.g. from squatting). Further functions of the front thigh muscles are the flexion of the hip joint and the tilting of the pelvis. The front thigh muscles are dominated by the four headed musculus quadriceps femoris. It consists of the straight anterior thigh muscle (musculus rectus femoris), the outer front thigh muscle (musculus vastus lateralis), the inner front thigh muscle (musculus vastus medialis), and the middle front thigh muscle (musculus vastus intermedius) below the rectus femoris. 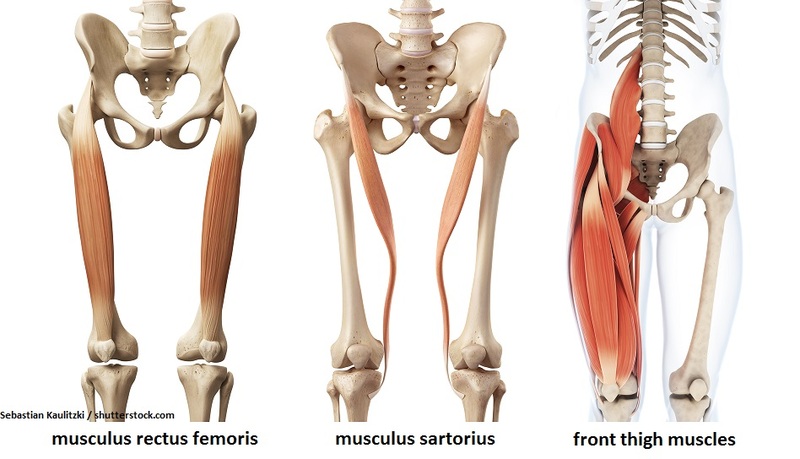 Furthermore there is the musculus sartorius which represents an oblique muscle that runs across the front thigh. 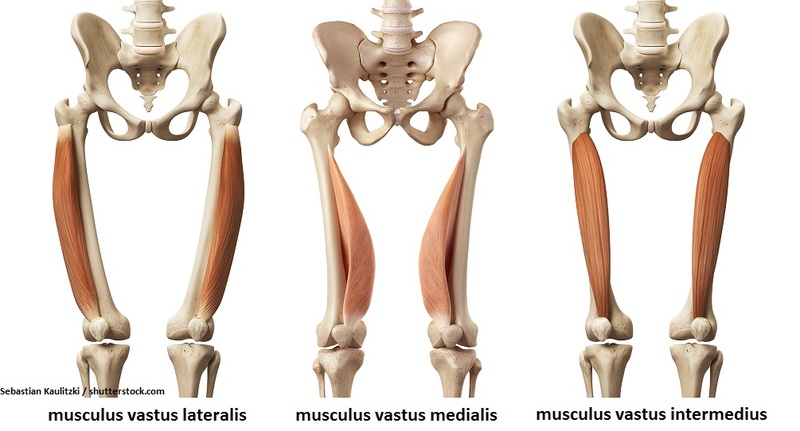 The three other heads of the large front thigh muscle are the musculus vastus lateralis (outer front thigh muscle), the musculus vastus medialis (inner front thigh muscle), and the musculus vastus intermedius (middle front thigh muscle, below rectus femoris). The function of these three muscle heads mainly is the extension of the knee joint. These three parts originate on the upper thigh bone. Depending on their respective position they are connected to the lateral, medial, and center portion of the thigh. All four heads of the quadriceps femoris insert into the patellar tendon that runs over the kneecap (patella) and is attached to the upper part of the shank (Tuberositas tibiae). All four muscle parts are also keeping the kneecap (patella) in its channel. The front thigh muscles are most important for movements, like: walking, getting up, climbing stairs, running, jumping, etc. Together with the hamstring they stabilize and protect the knee joint and prevent buckling in their static function. From a health-oriented point of view a regular training of the muscles of both, front and back thigh can prevent complaints, injuries, and premature wear of the knee joint. Also from an aesthetic point of view quite some importance can especially be attached to the outer and inner front thigh muscle. But be careful. Strength imbalances among the different muscle parts could lead to an irregular motion of the kneecap and knee problems. For the training, especially for the main exercises squats, leg press, and deadlifts it is very important to keep a correct hip-knee-foot-alignment. All three joints (hip, knee, ankle) should be kept in one line to each other. The body’s center of gravity lies on the middle of the feet on the entire soles. Also keep up the muscle tension during the entire repetition of an exercise. Heavy weights can cause back problems. Here, it is even more important to keep a proper execution.